If there were ever any doubts concerning the waning interest in baseball, the meeting of the magnates at Chicago during the past week must have dispelled them. The gathering was more like the meeting together of a lot of men to sing a funeral dirge than anything else. The proceedings were doleful despite the efforts of the magnates to wear smiles. Most certainly this annual meeting was far below par in enthusiasm with those of former years. To be sure, those persons who court notoriety by always wanting rules changed and tinkered were at the meeting. There was no millenium plan this time; it is an exploded bladder now, but there was the new diamond notion and a few other things just as silly and just as characteristic of liquid intellects as the Utopian "plan." Of course all the venders of quack remedies pointed out that "something must be done to revive an interest in baseball." Ah! You see they admit the game's popularity is waning. Happily no changes were decided on. BASEBALL has apparently served its day and its days seem near an end. Perhaps there may be a renaissance. But the ball players have come to the end of their string; they can play very little better; there is no more progress to be made. The people have seen it all. They are tired of reviewing it. As you can see, the proposal was to add a fifth base, with the middle bases positioned roughly where the infielders actually play. 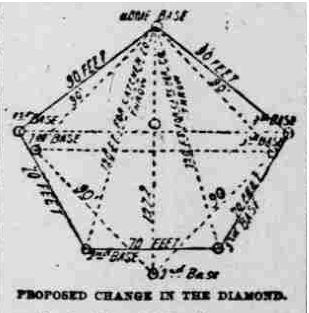 The basis for the proposal was twofold: One, it would increase the amount of fair territory by widening the angle between the first and third baselines, resulting in more base hits and fewer foul balls. Two, it would shorten the distance between stealable bases to 70 feet (along with the distance the catcher would have to throw the ball), leading to a more active running game. By keeping the distance to first and to home the same, proponents hoped to minimize the impact on infield hits and scoring plays. By adding an extra base station and increasing the total distance around the bases, the extra action of more base hits and base stealing would not necessarily lead to a huge increase in scoring.